How does UA Perfromance Mouthwear differ from mouthguards? Mouthguards provide protection. 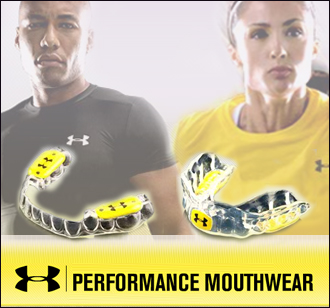 UA Performance Mouthwear, which includes mouthpieces and mouthguards powered by ArmourBite Technology, does more: It enhances performance. It is not only backed by some of the biggest names in pro sports, it's also recommended by dentists, pro trainers, strength coaches and wellness experts. Clenching the jaw triggers the production and release of a cascade of hormones, including cortisol, the stress hormone. UA Performance Mouthwear powered by ArmourBite Technology prevents teeth clenching and relieves pressure on the temporomandibular joint (TMJ). By preventing the excessive production of hormones, the body is able to unlock its full potential. Absolutely. There are studies published in peer-reviewed journals to support the claims. More information is available online at Under Armour.